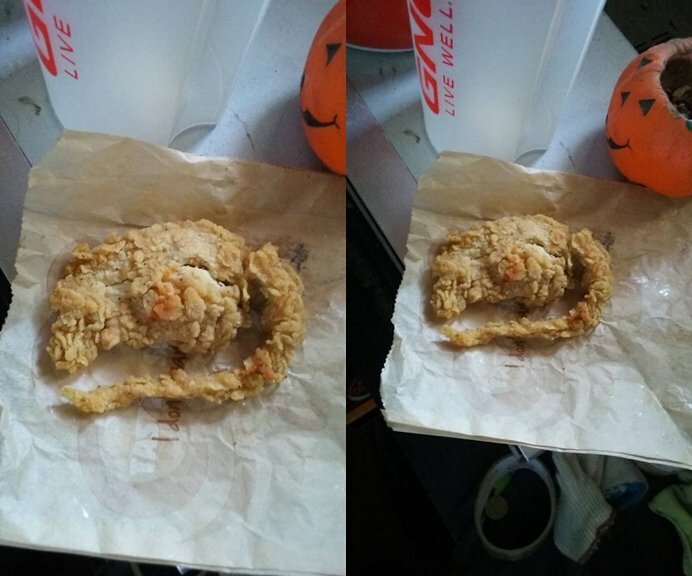 Customer Complains About KFC’s Fried Rat - 2NGAW! Are you a fan of fast food chicken? After reading this article, you might feel a little hesitant to dine out and order that food again. TheDailyPedia shared a report about a California customer who had an unusual complaint. The diner ranted that instead of being served fried chicken, the local KFC branch in his area served him with fried rat. Devorise Dixon was completely disgusted with the experience he immediately took his frustrations to the internet by taking a photo of the meal and posting it online. As you can see on the image, the shape of the ‘chicken’ in question does resemble a rat (complete with tail) but there’s more to it than the appearance. According to Dixon, he could’t help but notice that the meat was “hard and rubbery” and so he had to check. Upon noticing the rat-like shape, it “sent deep chills throughout (his) whole body” and so he made his worries known. Whether this is true or not, we should all be cautious with what we eat – especially when we eating out since we can’t see the food preparation process.